Here's a story to take our minds off the 24-7 media preoccupation with all things Michael Jackson and it has all the elements of wackiness necessary to hold our attention. No it's not the weird story of the brief thief I shared with you last week. And no, it's not about the last day in office of Sarah Palin - yes, she's wacky but I suspect her best, or worst depending on your perspective, is yet to come thus adding immeasurably to Tina Fey's popularity and income. No, the story I'm talking about was found in the New York Post and it reports on Charles Manson's Overture to Phil Spector. 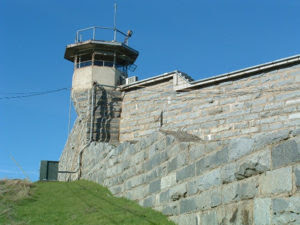 Spector, the famous music producer known for his so-called "wall of sound" approach to recording was recently transferred to Corcoran State Prison in central California, where Manson -- who masterminded the savage Tate/LaBianca killings 40 years ago -- is housed in a separate wing. Manson, who had a mad on for getting into the music business in the mid-60s before he gave up and settled for a quieter existence as a mass-murderer, apparently sent Spector a note praising his qualities as a music producer. Funny he didn't mention his admiration of his qualities as a murderer. 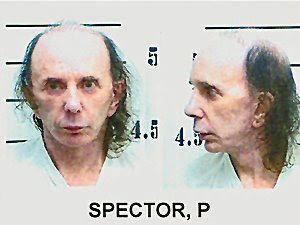 Spector, who reportedly threatened artists such as the Ramones and John Lennon with a gun and Leonard Cohen with a crossbow, is currently serving 19 years for the fatal shooting of a young actress. But despite his proclivity for brandishing weapons, there's no denying the man was a genius at the sound board producing such artists as the Ronettes, the Crystals and other "girl groups" in the 60s, the Righteous Brothers Ike and Tina Turner and even the Beatles. I wonder what Manson has in mind in striking up a friendship with Spector. Does he want him to Be My Baby? Maybe he's hoping they can throw off their shackles and sing an Unchained Melody. Perhaps he's enlisting Spector's help in escaping one night. You know, going over the wall of sound (okay, that was bad). Maybe it's not Spector he's interested in but his cellmate Ronald. Yeah, perhaps he wants to Da Doo Ron Ron. My Sweet Lord! Imagine! Get Back! Okay, okay enough with the music puns. Some people don't know that the murder of Sharon Tate and her friends was a case of being in the wrong place at the wrong time. 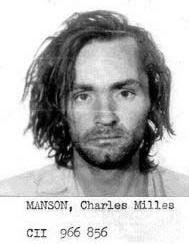 In trying to break into the music business Manson tried his best to impress Terry Melcher, then a top music producer and son of actress and songstress Doris Day. Melcher spurned Manson and Manson was so mad he sent his buddies out to murder him. Turns out Melcher's former address was the Tate household. Who was in the right place at the right time? Tate's husband Roman Polanski wasn't at home. Imagine if Manson and Spector would have hooked up (musically). God, could they have been the original Righteous Brothers? Applaud or you die! Pig! Don: ha, ha, yeah that'd be a killer concert. I'd not known about the wrong-place-at-the-wrong-time aspect of the murders. Didn't Manson claim The Beatles were speaking to him through their music? Perhaps, now, he thinks Ron was introducing himself through them.